Did you know there was a mini gold rush around Joshua Tree National Park? In 1873 the Blue Jay Mine became the first claim in the area and you can even hike out to the abandoned Lost Horse Mine in the park itself. What do you say we go and look to strike some Desert Gold together?! You don’t need to have the Midas touch when it comes to a Parker gown! The Desert Series continues with a glamorous sequin number that dazzles the eyes with desert golds and sky blues. Now, I know what you’re thinking…what on earth is she doing with an evening gown in the middle of the desert? Fashion, to me, is all about the unexpected. The essence of style is making it your own. When I began this journey just over 3 years ago, I had never done an editorial photo shoot in my life. What I learned in the process of creating these shoots was how absolutely amazing they would make me feel. I spent a lot of my life not allowing myself to have fun and now I do what brings me joy. I’ve also found immense power and healing in creativity as it has literally sparked me back to life. I have to laugh. When I think back to how many times friends and family would tell me how creative I was, I would do my usual self deprecating “thing” and discard the compliment. I could never seem to own the truth – that I am creative. Not only am I highly creative, I absolutely love the creative process itself! I’ve shared many times that I happen to be a slow learner. It may have taken me 54 years to embrace my creative side but today I enjoy it more than ever before. When I have the opportunity to do photo shoots in the desert, I spend a lot of time selecting the perfect look. I have a vision for what I want to create. I have absolutely no experience at this at all…none…zero…zippo…except for what my photog and I are teaching ourselves along the way. My Desert Series began with an out of this world design by the sisters behind the brand, We Are Leone, which you can see in a previous post. The ethereal gown inspired the rustic backdrop as the ideal juxtaposition for the perfect composition. The next post in the series was a vastly different bohemian look by Free People which you can see here. 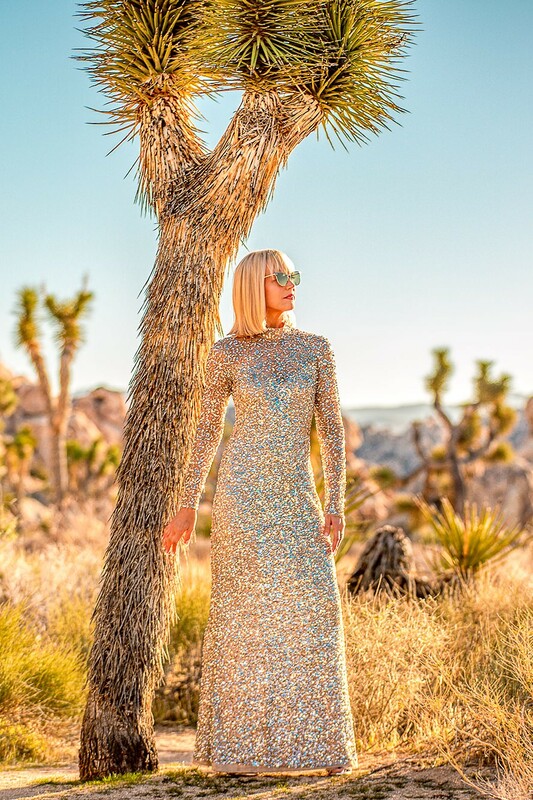 This time, it’s Joshua Tree meets Red Carpet Style with a classic design covered in glittering gold sequins. What do I love about this look? First of all, the style is timeless. A sleek turtleneck with a slim and fitted gown that’s figure flattering and a show stopper all at the same time. This dress is made to be forgiving as it’s lined with a sheer fabric that moves along with you. It has the perfect amount of stretch which also ups the comfort factor. Sequin gowns are notoriously heavy with the weight of the gitter and the fabric can be “scratchy.” You won’t find that in Parker. I’ve owned several of their gowns and they design for comfort. You may be surprised to find that I do a lot of my designer shopping at an unlikely online source, Amazon.com. Over the past year, Amazon has expanded into new territory, adding in lots of fabulous designer labels, including Parker NY. I’ve been wearing Parker NY for well over a decade, having discovered the designer at Neiman Marcus long ago. I was delighted to peruse Amazon and find a wide range of styles by Parker added to the mix this past year. One of my top style “hacks” is to comb the online sites to locate designs that I love. I’ll then search Amazon to see if they happen to carry the same design. I’ll keep checking back on Amazon as different boutiques often the same style but in a wide variety of prices. Although the current retail price of this dress is $698, I didn’t pay that price. Not even close. I kept an eye on the price and found one Amazon boutique selling it for $392! With one click and Amazon Prime, it arrived at my door the next day. It’s still a healthy investment for a dress, but one whose style is timeless rather than trendy. It’s a gown that can be worn time and again, year after year. When it comes to a dress that’s an attention getter like this one, my feeling is it’s best to keep accessories to a minimum and let the dress be the focal point. The look naturally lends itself to an elegant, strappy sandal. I pulled out a pair of my favorites, a silver strappy tie up sandal, from Chelsea Paris. Chelsea Paris is one of those designers I’ve found that’s far more affordable than top designers like Aquazurra or Stuart Weitzman. I was trained at a young age to be on the hunt for value. That will always be part of me. I love sharing my favorite deals and steals and Chelsea Paris is no exception. I found this pair at one of my top designer discount sites, Yoox.com. Yoox is a fabulous amalgamation of my favorite designers at prices way less than retail. If you sign up for their email list, you’ll be kept abreast of their extra special sales which happen frequently. The only extra thing needed for this look was a pair of glamorous sunnies and Le Specs has some of the most beautiful shades for both and night. I wouldn’t recommend trying to scale a cliff side in these heels, but that didn’t stop me from trying. I shared the story behind the climb in my last Moxie on Monday post. It’s taken me most of my life to realize there isn’t anything I can’t do if I put my mind to it and that includes hiking in the desert in designer heels and a glamorous gown. There truly “Ain’t No Mountain High Enough” for a Fierce Woman at Midlife. So if you happen to be hiking through Joshua Tree National Park and find a trail of gold on the ground … don’t get too excited. They’re just stray sequins from CatherineGraceO! Cheers, Beauties! Stay Fierce. Love your fierce and mighty self. You always amaze me by your creativity in your shots, dress code, accessories and all those small details. I love you sharing that most sequins dress are itchy, scratchy and heavy duty, part of the sequin squad….lol I love your bargain finds and you seem to introduce superb designers and websites where you can bargain. Interesting that your brought that you did not believe in the compliments shared by friends and family in the past such as your creativity. Neither did I until couple years back. My compliments were seldom from family and more from friends. I love your sweet energy and sharing your words of wisdom. Every person that knows you, just wants to share more of Catherine’s energy like myself. I am forever grateful of you, inspiring and motivating me because that’s what sisterhood is all about. I love that I have your support and I do believe many women share this experience. I find fashion to be life changing! Isn’t it stunning, sister? How’s my girl doing??? Great tips! There are always sources to find the same thing cheaper!! Next time it’s real gold sister!!! I’m in NYC May 6th. Eugenia is working to organize a day event as I’m flying in for an event that night. Hope to see you!